Fifty samples of pleural effusions were simultaneously evaluated by cytology and flow cytometry. After the acquisition of data on flow cytometry (FCM) the cytological diagnosis of the samples were compared with diploid and aneuploid DNA histogram. It was observed that by flow cytometry it is possible to detect more number of abnormal cases than by cytology alone. 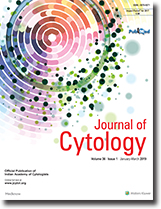 In cases where the cytology is suspicious of malignant cells, the flow cytometric DNA analysis can precisely differentiate diploid and aneuploid cell population, which strengthens the concept that FCM DNA analysis can be considered as an adjunct with cytological diagnosis of pleural effusions. Three hundred patients with oral cavity and jaw bone lesions were studied from the standpoint of the efficacy of fine needle aspiration cytology in their diagnosis. In all cases final diagnosis was established with the help of histopathology. There were 105 benign, 27 premalignant and 168 malignant lesions. A wide variety of benign lesions were seen and the diagnostic accuracy of aspiration cytology was found to be 97.14%. Out of a total of 27 premalignant lesions leukoplakia accounted for the maximum number of cases followed by dysplasia. The positive correlation of FNAC for premalignant lesions was 87.5%. Squamous cell carcinoma was the commonest encountered malignant lesion and the overall accuracy of the cytological diagnosis was 97.94%. Maximum number of insufficient aspirates were seen in the benign lesions (33.33%). In present study, comparative evaluation of routine unguided FNAC and ultrasound guided FNAC in cases of intra-abdominal lumps was done. All cases of intra-abdominal lumps were divided clinically into palpable and nonpalpable lumps. Cases with palpable lumps were subjected to routine unguided FNAC, whereas US guided FNAC was done in all cases of intra-abdominal lumps. All smears were analysed objectively using a point scoring system. Routine FNAC yielded adequate material in 64.81% cases with diagnostic accuracy of 61.11%. In ultrasound guided FNAC material was found adequate in 93.06% with diagnostic accuracy of 87.50%. After analysing all the smears according to predetermined criteria, it was noted that smears formed by US guided FNAC are of superior quality in significantly higher number of cases as it improves yield of diagnostic material and good quality smears with high diagnostic accuracy. During pregnancy, breast lumps can not only arise de novo but pre-existing lumps can enlarge and at times some of them can recur in the subsequent pregnancy. FNAC picture of benign lumps can be sometimes so disturbing that over diagnosis of malignancy is not uncommon. On the other hand occurrence of truly malignant tumours during pregnancy and lactation should be correctly diagnosed, to plan the treatment. Herein we report FNAC of 13 cases of breast lumps in pregnancy and lactation. All the patients were between 20 and 30 years of age. Seven of them showed essentially benign cytologic picture with certain atypical features while in the remaining 6 cases FNAC showed predominantly malignant cellular morphology necessitating further immediate surgical management. This study involves 20 cases of rare malignant neoplastic breast tumours encountered out of the 1100 breast biopsies studied over a period of 5 years. Most of the cases were initially diagnosed by fine needle aspiration and subsequently confirmed by histopathological examination. This study highlights the efficacy of fine needle aspiration cytology in the diagnosis of rare and enigmatic malignant breast lesions, determines our experience of their incidence and encompasses the diagnostic hitches and special features encountered in the study of rare breast malignancies. A total of five cases of parathyroid neoplasm including four of parathyroid adenoma (PA) and one case of parathyroid carcinoma (PC) with available cytology and histology were studied. The salient cytological features included predominant dissociated epithelial cells with small groups palisading around capillaries, more so in PC. Minimal nuclear pleomorphism with evenly dispersed nuclear chromatin and presence of single to multiple inconspicuous nucleoli differentiate parathyroid from thyroid neoplasms. Presence of abundant pale blue cytoplasm showing vacuolations and lipophages in the background are soft pointers to neoplasm of parathyroid in origin. Cytology together with the clinical, biochemical, and radiological data may allow the recognition of parathyroid neoplasms prior to surgical intervention. Giant cell tumour of the bone is a benign tumour with a propensity for local recurrence and occasional distant metastasis to the lung. This tumour is usually seen in the third and fourth decades of life with female preponderance. Though recurrence is common, the occurrence of metastasis is usually seen in the malignant variant and the commonest site is lung. We report a case of giant cell tumour of the radius in a 40 year-old male who had repeated local recurrences and subcutaneous metastasis to the dorsum of the hand. Fine Needle Aspiration Cytology (FNAC) was helpful in making the diagnosis at each time. Peritoneal malignant mesothelioma is a rare tumour, which can be diagnosed by the needle aspiration cytology. We report a case of 56 year old male presenting with diffuse intra-abdominal mass diagnosed as malignant mesothelioma on FNAC and confirmed subsequent by histopathological examination. A 29-year-old, non-pregnant, non-lactating female, presented with bilateral painful breast masses. The patient had no history of tuberculosis in the past nor did any of her relatives. Clinical examination revealed tender deep-seated lumps in both breasts. Fine needle aspiration of the lumps was reported as granulomatous mastitis. The patient had an elevated ESR. The chest X-ray was normal, and IgM and IgG ELISA for tuberculosis were negative. Subsequent surgical drainage of the lumps revealed abscesses containing pus and necrotic material, which extended into the retromammary spaces. Culture of the pus from the abscesses showed exuberant growth of mycobacterium tuberculosis on Lowenstein Jensen medium on three successive occasions. The biopsy of the abscess wall showed multiple granulomas in the breast tissue with langhans giant cells, epitheloid cells and lymphocytes. Cutaneous lymphangioma circumscriptum, is a type of lymphangioma affecting skin, which is an uncommon benign tumour of lymphatic vessels. We report one such case in an 8 year old boy with an aspirate from a swelling having a warty skin surface in the left illiac fossa. It posed a diagnostic dilemma because of its cellularity and numerous small round cells, which were arranged in singly, in groups, sheets and in pseudo-rosette like pattern at places mimicking small round cell tumour. The initial cytologic diagnosis of a small round cell tumour possibly lymphoma was rendered. This case highlights the diagnostic pitfall encountered in the aspiration cytology of lymphatic tumours. Dermatofibrosarcoma protuberans (DFSP) is a relatively uncommon cutaneous soft tissue neoplasm with a tendency to recur. It commonly occurs in the trunk and extremities. It rarely metastasizes. A 30-year-old male presented with a recurrent multinodular mass over lower back with a 6-month history. Earlier he had undergone an excision for a small nodular mass over that area with unknown biopsy results. This time, a diagnosis of spindle cell tumor with a possibility of DFSP was made with the clinico-cytological correlation. This was further confirmed on biopsy, special stains and immunohistochemically. Typing of certain specific soft tissue tumors can be made on cytology with clinicopathologic correlation. The incidence of thymoma in our part of India is minimal. We were able to diagnose a long-standing, misdiagnosed case of invasive thymoma by initial pleural fluid analysis and CT guided FNAC and later on, confirmed the diagnosis by carrying out immunohistochemistry of the biopsy specimen. He was successfully treated with external radiation and chemotherapy even though he presented to us as a stage IVA disease. After a latent period of 6 months, he succumbed to metastasis in the brain. We present this case for its rarity in our region and the initial good response followed by rapid deterioration. Solitary plasmacytoma of bone is uncommon and occurs in 3% to 5% of the patients with plasma cell neoplasms. It may involve any bone, but most commonly it arises in a vertebra (in about l/3rd of the patients). The typical patient is more frequently male (70%) and about 7 years younger than the typical patient with multiple myeloma. We report a case of a 45 years old female who presented with a painful swelling at the left shoulder joint. On X-ray, a lytic lesion was seen on the posterior part of upper end of humerus. FNAC from the site showed presence of sheets of plasma cells. Bone marrow aspirate contained no evidence of multiple myeloma and Immunoelectrophoresis of the serum showed no M protein.